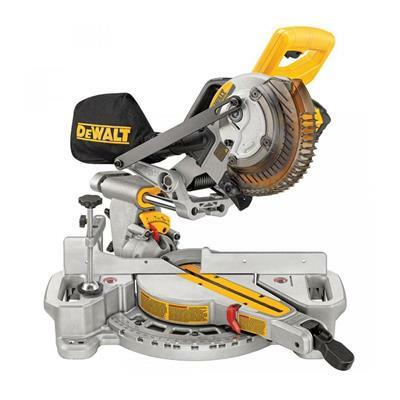 DEWALT DCS361B 20V Max Cordless Miter Saw (Tool Only) utilizes a 20V Max Battery Pack which provides on average, 183 cuts of 2x4 Pine - or 275 cuts of 3-1/4 inch Pine baseboard. It offers an integrated XPS cross cut positioning system that provides adjustment free cut line indication for better accuracy and visibility. The 7-1/4 Inch Sliding Miter Saw features a single left bevel which ranges from -3 Degree to 48 Degree left. With a 3-1/2 inch maximum vertical, 3-5/8 inch crown nested, and 2x8 inch horizontal cut capacity, this saw will handle most of the common cuts needed. The adjustable stainless steel miter detent plate has 11 positive stops to improve productivity and ensures cutting accuracy. An oversized bevel scale makes bevel angle adjustments accurate and easy. The compact, lightweight design (31.6 lbs.) allows for easy transport and storage. It has a cam lock miter handle which delivers quick and accurate miter angles, along with a precise miter system and machined base fence support for optimized durability and cutting accuracy. Vertical Capacity: Baseboard Against Fence 3-1/2"
Vertical Capacity: Crown Molding Vertically Nested 3-5/8"
Horizontal Capacity: Baseboard Lying Flat 8"
Horizontal Capacity: Crown Molding Lying Flat 8"
45 degree Bevel Cut Capacity (dimensional lumber) 1.5" x 8"
90 degree Cross-Cut Capacity (dimensional lumber) 8"
90 degree Cross-Cut Capacity (Max Width) 8"
45 degree Miter Cut Capacity (Max Height) 2"
Item Length: 25 in. Item Width: 20 in.